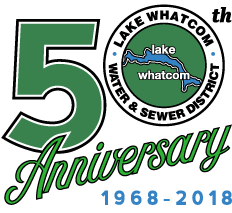 Lake Whatcom Water and Sewer District is a non-profit municipal corporation. The District’s five-member Board of Commissioners are elected officials who set the rates and establish the District’s policies in accordance with Washington State Law. Commissioners are required to live within the District’s boundaries and in the area which they represent. Rates and charges are designed to provide for the prudent financial management of the District and are based on the cost of service. Bills are due on the 20th of the month following the date of the bill. A late charge of 10% of the total past due usage balance is applied to the account. Once applied, late charges cannot be removed from a customer account unless approved by the District’s General Manager. Additional fees may apply for any returned payment return items, including auto-pay and NSF checks. For accounts where water and sewer service charges are not paid within sixty days of the billing date, the District may interrupt water service and padlock the meter. In order to have service restored, the bill must be paid in full. If your service has been suspended, do not make payment through Xpress Bill Pay, payment must be received by our office directly. During office hours (8:00 a.m. – 4:00 p.m. Monday-Thursday), you may make a payment in person or over the phone for the account balance. A $50 lock fee will be added to the next bill. Outside of regular office hours (After 4:00 p.m. Monday – Thursday or anytime on weekends) you may call to have your meter unlocked. Payment in full, including the additional after-hours unlock fee of $150 must be received over the phone or at the office by noon the next business day, or the meter will be re-locked. Do not remove the lock from your meter box yourself. If a lock is cut or removed without District authorization, an additional $150 fee will apply. All unpaid water and sewer charges, when delinquent for sixty days or more, shall be a lien against the property being served and a lien processing fee charged to the account. In the event the customer fails to bring the account current within six months, the account will be referred to the District’s legal counsel to begin formal foreclosure proceedings against the property. With approval from the Board of Commissioners, the District will adjust high water bills resulting from in-ground service line breaks between the water meter and the entry point of service into the building. To request a billing adjustment, the customer must complete an “Application for Water Bill Leak Adjustment Credit” form and provide evidence that the leak is now repaired. Evidence includes a paid invoice or a receipt for repair parts. Water leak adjustments are limited to one adjustment per account per year. The leak adjustment applies to one billing cycle only. When a leak occurs, the overage may appear on more than one consecutive billing cycle. The District will adjust the higher usage billing cycle to ensure that the customer receives the highest possible adjustment. The credit applied will be approximately one-half of the overage incurred during the billing cycle of the leak. There is no cap to limit the customer’s costs. Late charges on the leak amount will be waived if the customer adheres to a prearranged payment schedule as negotiated between the customer and the Accounts Receivable department. At the property owner’s request, water and sewer service billing may be temporarily suspended and service discontinued. To request a discontinuance of water and sewer service for an extended period of time, the customer must complete a “Billing Suspension Request” form and pay any outstanding account balance in full along with the billing suspension fee. Once the completed form and fees have been received by the District, the service will be locked and the billing will be suspended. To resume water and sewer service, the customer must contact the District office and request that the meter be unlocked; a 24 hour notice is required. Services will be unlocked during normal business hours only, Monday through Thursday. The Board of Commissioners has authorized the suspension of water and sewer services without charging a fee if a house has been demolished or become uninhabitable due to a fire, flood, or other such disaster. Under these circumstances, the water and sewer billing will be suspended and the meter either locked or removed. The property owner is required to request a suspension of service in writing and pay any balance owing on the account prior to the billing suspension. Payment of a permit fee may be required in order to resume water and sewer service to the property. For more information regarding this option, contact the District’s Engineering Department. A sewer only customer is a sewer customer who is not connected to any of the District’s water distribution systems. This policy provides sewer only customers with a means to suspend billing while ensuring the District that the service is not being used. Prior to billing suspension, the customer must obtain a permit from the District to install a two-way clean-out and pay all of the applicable fees and charges. The District will then install a plug in the two-way clean-out to prevent flow in the service line. Billing suspension begins when the plug has been installed and inspected. It is the customer’s responsibility to notify the District in writing at least two business days prior to the desired date for return to service. For more information regarding this option, contact the District’s Engineering Department.